B2B Customer Experience shows readers how to deliver the very best customer experience (often referred to as CX), within the business-to-business realm. Marketers have long known that emotions are important in driving our experiences, and the subject is now high on the agenda of B2B companies who want to deliver a 'wow' to their customers. Achieving this 'wow' factor helps organizations distinguis… h themselves from their competition, while simultaneously winning new business and retaining existing clients. 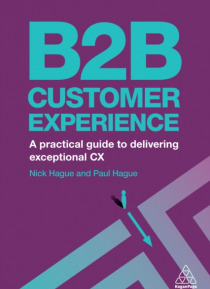 B2B Customer Experience is the essential handbook that guides the reader through the process of creating an exceptional customer experience. Intensely practical in its approach, B2B Customer Experience is divided into five parts to walk readers through the journey of planning, mapping, structuring, implementing and controlling an effective customer experience, all bespoke for the B2B environment. Clearly argued and supported by real-world examples, this text will help readers understand critical features including the difference between customer experience, loyalty and inertia; how to use journey maps to establish strengths and weaknesses in an organization, and how to ensure that sales teams are engaged in the customer experience programme. Discussing some of the best known examples of consumer-focused customer experiences from companies such as Zappos, Nordstrom and John Lewis, B2B Customer Experience is the must-have text for any marketing professional working within a B2B environment.